Startup Demo Day offers undergraduate and graduate students the opportunity to hear pitches from startup leaders in clean energy innovation. These leaders will also describe internship and job opportunities available for students within their companies. After the presentations students will be able to network with entrepeneurs and learn more about their experiences. Presented in partnership with the Duke Innovation & Entrepreneurship Initiative. 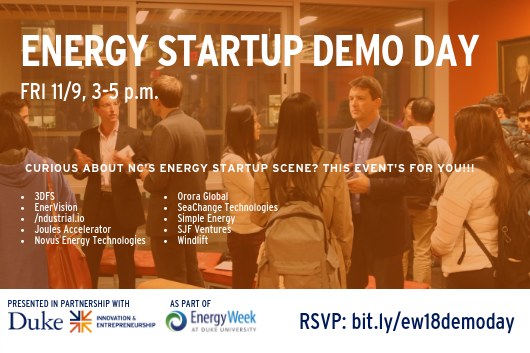 Confirmed startups include Windlift, Novus Energy Technologies, Orora Global, Ndustrial.io, 3DFS, Seachange Technologies, SimpleEnergy, and EnerVision Inc, with SJF Ventures and Joules Accelerator also making appearances.